This review is about 8 printed pages long. It is copyright © Donna Stonecipher and Jacket magazine 2008.See our [»»] Copyright notice. A garden is a curiously, and famously, double space. It is, first and foremost, both nature and culture. Then, it is both a real place and an imaginative space. It is to be both used for practical purposes (growing vegetables, for example) and enjoyed for sheer beauty (flowers); it is a place to escape oneself (to lose oneself in nature) and a place to find oneself (to rediscover one’s relationship to the world through the medium of nature). It requires a lot of effort, but for best effect should look effortless. If it is private, it will inevitably cede to a public it positions itself against, through time; if it is public, it will be used for all kinds of private activities. It is the origin of the world and, in its guise as cemetery, the end of it. It is remarkable that such an inherently ambiguous space has received relatively little formal attention from poets. Whether it is because the subject seems too occupied by biblical content or too unoccupied by psychological or sociocultural content, or simply because it has served primarily as a place from which to speak rather than as a subject to be investigated in its own right, gardens themselves, while unquestionably at home in the realm of poetry, have seldom occupied center stage thematically. Cole Swensen began to fill this gap with 1991’s Park, and has radically developed and historicized the subject with her new book Ours, a meditation on the French formal gardens that began life as the playgrounds of kings and queens in the seventeenth century and that are today public parks where any plebeian wandering through or sitting on a green metal chair reading a newspaper can feel, briefly, like royalty. While the garden served more as a setting for Park’s more pressing themes, which included blindness, repetition, and memory, and whereas Park’s gardens were generic and their architect purely fanciful, all of the parks Swensen writes about in Ours are real (though their perceptual reality still interests Swensen less than their phenomenological reality), as was their designer, André Le Nôtre. 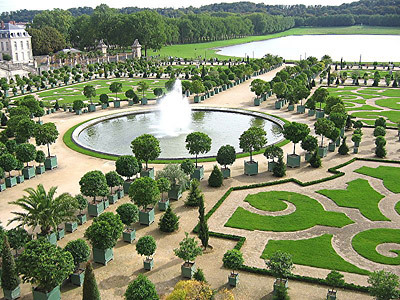 Le Nôtre (1613–1700) was a landscape architect who had the apt fate to have been born in a garden (the Tuileries in Paris), a fact Swensen delights in. She also delights in the fact that Le Nôtre’s name in English means “Ours.” In a short introduction to the book, Swensen notes that Le Nôtre was, though a gardener to the most exclusive clientele imaginable, remembered as “a great guy — modest, fun-loving, easygoing, and friendly.” The gesture of the colloquial language — “great guy” — in an otherwise noncolloquial introduction is a signal of the “ours” that is to come in the book, as Swensen constantly works, through means linguistic, thematic, and spatial, to bring this privilege-tinged, noncontemporary subject matter down, literally, to our earth of 2008, even while she takes pleasure in the beauties and particularities of the seventeenth-century mind and its productions. Never explicitly addressed in the book but always a subtext is its paradoxical situation — that Cole Swensen, American poet of the twenty-first century, non-royal, is poetically engaged in English with French (formerly) royal gardens she has access to thanks to the twists of history. Of course, one could read the triumphal note of “Ours” as a political statement — the triumph of the communal over the private that has been the result of one particular strand of European history. And class is certainly addressed in the poems, often in the book’s most playful moments. But Swensen’s concern is not with placing herself physically as an American, non-royal self in the gardens — or as a self at all (though one assumes she has spent a great deal of time in them) — but with engaging imaginatively and intellectually with the ideas of the gardens and with their varietal possibilities for meaning. And while the gardens are thus not quite “imaginary” in the Mooresque sense, the poems are far less interested in the flowers under the nose than in how meaning flowers in the head. The doubleness of the garden opens up a symbolic space that allows for many meanings to be overlaid on and drawn from it, and perhaps the most striking aspect of the book on first read is Swensen’s ample use of the copula. According to the poet, the garden is, among other things: a start, a mirror, a description of its era’s metaphysics, a sequence that has no basis in fact, a way of making nature account for the mind, a machine for multiplying, an allegory, an asymptote, a portrait, a tide, and a tithe. When it is not part of an a = a equation, the garden’s capacity to stand in for other ideas is pointed to through the use of “as”: one poem is titled “A Garden as a Letter,” another “The Garden as Architecture Itself,” etc. It is perhaps this quality of blankness, which lets the observer draw her own conclusions, that most cunningly reflects the garden’s “nature” half’s relationship to its “culture” half: landscape has always been a form of matter that people have wished to mark, to name, to change, to frame, to impose upon. In Swensen’s rhetorical insistence on the garden’s metaphoric possibilities, the garden becomes the great available signifier, which has a seemingly endless capacity for signifieds. You see in a garden what you want to see, and that’s what makes gardens so rich in symbolic ascription. A garden does not only make “nature account for the mind,” as Swensen so perceptively writes; it also makes the mind account for what the mind has created within nature, for the mind’s status within nature. According to Swensen, a garden is a reflecting pool for the mind’s wish to impose order, for the human ambition to design. The book is divided into nine sections, beginning with “History” and winding towards “‘You Are a Happy Man, Le Nôtre’” (a quote from Louis XIV), passing through such sections as “Statuary,” “Orangeries,” and various named gardens (among them Versailles) along the way. Swensen’s now-trademark procedure: choosing a subject that fascinates her — such as opera, books of hours, hands, and, most recently, glass (in the books Oh, 2000; Such Rich Hour, 2001; The Book of a Hundred Hands, 2005; and The Glass Age, 2007) — immersing herself in research on it, and writing poems that take off from and include some of the findings of the research, always interrupted, played with, and torqued by various means — has found a particularly fitting subject in the gardens of Le Nôtre, who took the given of the garden (a plot rather like a page) and liked to fill it with optical surprises and mathematically determined perspectives. As Swensen notes Le Nôtre’s ambition “to create gardens unprecedented in their appeal to both the eye and the mind,” one can’t help but think of her pages and their interplay of white space and text. got rich in the trees. he said, my seventy, I am. There are moments when these elisions and interruptions, which often come in the course a fascinating historical anecdote, can frustrate, but that frustration is part of Swensen’s intention. Interruption and fragmentation are, of course, well-used modern techniques to question the seamlessness of narratives that have been used to justify, among other things, power structures like that of the French monarchy. But Swensen’s use of them takes on a particular relevance in this book because of the especial danger (and allure) posed by the garden, which is intended to provide a totalizing environment, shutting out the world (and especially the urban part of the world) and excluding those who are not privy to its privet hedges. For exclusion, of course, has been part of paradise since the days of the garden of Eden. The breaking up of her syntax interrupts the seductive lull into which a garden is designed to hypnotize its visitors to remind us that a garden is actually heavily encoded with socioeconomic messages. just shot. They called it a park. The matter-of-fact statements such as “They called it a park” have a deflating effect that seems calculated to remind the reader (and perhaps the poet herself) that the often dizzying flights of fancy enacted by the manipulation of line and narrative are just that — flights of fancy — that must eventually come back down to earth. After all, one must remember one’s relationship to the garden. Unlike the birds, at some point — perhaps dusk — one must go home. As with the “great guy” in the introduction, the disciplined turn to the mundane and colloquial keep the poems from floating off into the purely speculative, or the purely aesthetic, or into the potential rococo of their subject matter (which artistic movement was, in the succeeding century, to culminate the dangerous fancies of the French aristocracy). There is a kind of moral impulse behind them. Swensen is a poet seriously attracted by highly aestheticized surface beauty who knows that its lure must be resisted, questioned, confronted — even while, to a certain extent, indulged. A section of the poem “And the Birds, Too” ends, “[A]s if you could open a jar of sugar forever.” The implication in that “as if” — that you can’t open a jar of sugar forever — reads like a complicated recognition of this attraction and the impossibility of its fulfillment. Swensen writes, in the same section, “Everything he [Le Nôtre] ever planted now is dead,” but while the original organic matter of Le Nôtre’s gardens has long since been replaced and replaced again, the ideas of the gardens, and thus of their creator, have not died. And as long as that is true, the garden lives on with subsequent generations of pansies (French pensées, or thoughts), filling the parterres, and Le Nôtre attains a species of immortality. The dialectic of nature and culture here, of time and order, of finitude and infinity, is subtly addressed everywhere in the book. Swensen’s use of anachronism, along with her linguistic experimentation, also distinguishes her books from what, in lesser hands, can be merely “historical poetry,” diminished by a rigid divide between historical and actual, plenty of which is being written and published, and which comes to resemble a dull reworking of the card catalogues of history. In fact, it is in Swensen’s skillful interleaving of the historical and the contemporary that her project takes on a much more serious impetus: the book could be read as gesturing toward a critique of the very formulation of linear history, positing that the relationship between the present and the past is as intertwined as vines on a trellis. Swensen interacts with the facts of history, rebelliously, as much as she collects them, scrupulously. This combination of the meticulous and the mischievous brings the poems to a serious historiographical inquiry: what kind of authority does history actually possess? André Le Nôtre thought that by gardening along the strictest principles of geometry, time would come apart in his hands. There goes private property. It’s Le Nôtre’s effort to overcome the strictures of time through spatial means that brings the garden to its most devastating metaphorical usage. This conundrum also gestures to the other great obsession of the period: the Grand Tour. After all, why did the two English schoolteachers start time-traveling only in France? Couldn’t a visit to Kew Gardens in London have done the trick? And why did it happen in the park of Versailles and not in the castle, or even in central Paris? It seems clear that the combination of the intensity of the foreign and the confusion induced by the liberation of the garden presents a danger to linear time. But for all the garden’s possibilities for escape from time, it is also a place where the limits of physicality are to be transcended: The “history of gardens is the history of views,” declares the poem “Leaving the Middle Ages,” pointing to the great Renaissance and Baroque gardeners’ obsession with orchestrating the extension of the line of sight and providing belvederes and lookouts: “Le Nôtre couldn’t stand views that end” is a quote from Saint-Simon that appears in the first poem, “History.” Because “. . . a garden includes / everything you can see from the garden” (“Saint-Germain-en-Laye”), the visual aspect of the experience of being in a garden opens up spaces beyond the garden, leading, eventually, to infinity. 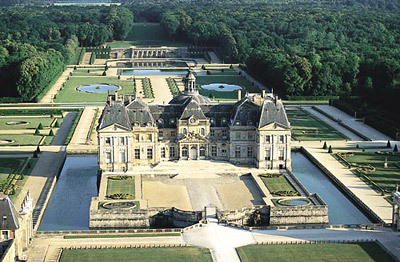 Of course, the views from a place like Saint-Germain-en-Laye or Versailles in the seventeenth century would presumably have led the visitor to a less exalted place: farms or royal forests, so that Le Nôtre’s views are the views of the aristocrat surveying his demesne from a comfortable perch — “everything you can see from the garden” is more of your own property. Such a view would have gone from green to green: from aestheticized nature to commodified nature, rather than giving any glimpse of what one might see today from such a garden, such as urban or suburban sprawl, which would disrupt the fantasy of nature’s, and the self’s, infinity. In Swensen’s gorgeous and complex engagement with Le Nôtre, she has managed to make a resonant place for him in American poetry, so that the French gardener to kings and queens is now “ours.” There, indeed, goes private property. Donna Stonecipher is the author of three books of poetry: The Reservoir (Georgia, 2002), Souvenir de Constantinople (Instance, 2007) and The Cosmopolitan (Coffee House, 2008, winner of the National Poetry Series selected by John Yau). She lives in Athens, Georgia, and Berlin, Germany.